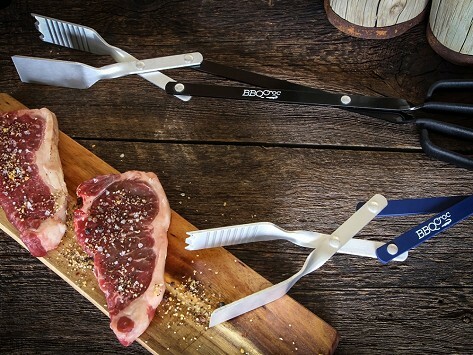 Most BBQ tools serve a single purpose, but this one is quite the multitasker. It's a 3-in-1 spatula-tongs-scraper that keeps your hands away from the heat and you in control of the cooking. The dual-spatula system makes for the perfect flip, and when used as tongs, opens wide enough to grab a whole chicken or roast. Dimensions: 18 Inch: 18.38" x 4" x 1.75"; 21 Inch: 21.25" x 3.75" x 1.75"
Weight: 18 Inch: 0.48 lb. ; 21 Inch: 0.5 lb. I bought these as gifts for all of my son-in-laws after I bought one for us to try. All the guys like them. Use it all the time. It works wonderfully. Love it! Purchased this as a gift for my son, who grills a lot. He says they work perfectly well. After 20 years in culinary publishing, Maker Nicolas Vallee had tested enough BBQ tools to know he could create something more versatile and helpful. On a trip to South Africa, he found his inspiration—a long tool used to move coals and wood around in the fire. Getting hands too close to the heat is a common grilling pitfall, as is losing control of food while flipping. Nicolas’ 3-in-1 BBQ tool solves those problems and more. Lightweight and dishwasher-safe, this spatula-tongs-scraper is made of food-grade aluminum, so it won’t rust. The dual-spatula system gives you a firm hand on whatever you need to flip, and when used as tongs, the tool can open wide enough to grab a whole chicken or roast. When dinner’s done, use the scraping edge to get rid of cooked-on grill gunk.